We all want to protect ourselves and our families against fraud and scam, but there are so many out there! In just one year, fraud cost older Americans $2.9 billion. Many scams target our seniors, especially those who live alone. It’s important to educate yourself and older members of your family to recognize the signs of phone scams. Never give personal or bank account information. 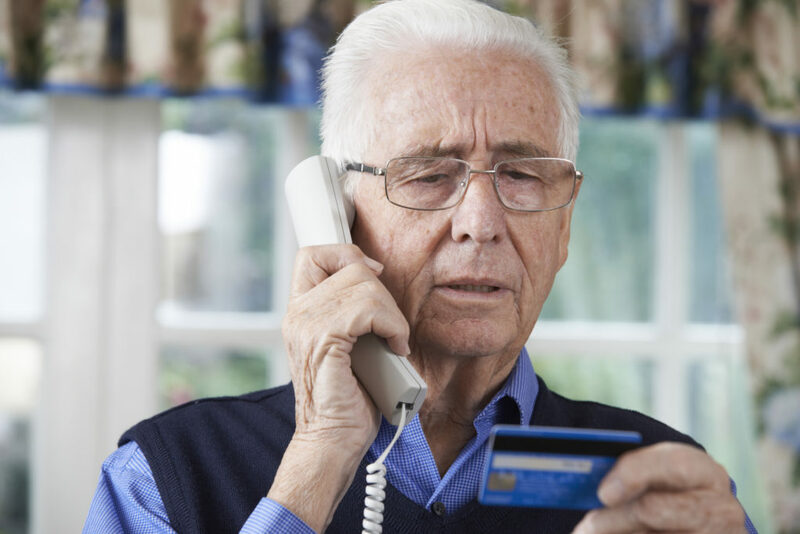 People over the age of 65 make twice as many purchases over the phone as the rest of the population, making them easy targets for telemarketing scams. This kind of fraud is very hard to trace. To avoid falling victim to telemarketing scams, never give anyone your personal information or bank account information over the phone, and if you are feeling pressured to do so, hang up. Here are different kinds of telemarketing frauds to look out for, and avoid. The “pigeon drop”: A person will call and claim that they have a large amount of money that they want to split with you. They will request a “good faith” payment. Fake accident calls: A person calls and informs you that your child or another relative is in the hospital or has been arrested and needs money immediately. They will ask you to send money for the well-being and safety of your loved one. Charity scams: A person will call and request money for a fake charity. This occurs most often after natural disasters. Never send money to someone claiming that you have won a sweepstakes or lottery and need to pay to receive the prize. In this scam, people call and say that you have won a lottery or sweepstakes but in order to receive the prize money, you must pay to receive it. Sometimes, the scammers will send a check. Do not deposit that check; it is fake. Don’t send money to people who claim to be your grandchild or loved one over the phone. Commonly known as the “grandparent scam,” this scam involves a scammer calling and claiming to be your grandchild. The caller will claim to have financial problems, such as overdue rent or car payments, and will ask for money. They will ask that you pay them through Western Union or Money Gram, which don’t require identification to collect. These grandparent scams have become more and more sophisticated, with scammers doing research on the actual grandchildren, and using accomplices to imitate their voice over the phone. They may also contact your grandchild and claim to be from a cell phone company, instructing your grandchild to turn off their phone for a “maintenance project.” This makes it harder to confirm the whereabouts of your grandchild once the grandparent scam call has been made. Don’t give personal information to a caller claiming to be a Medicare representative. In this scam, the caller claims to be a Medicare representative, calling to issue you a $250 refund check to cover the gap in covered prescription charges. They will ask for personal information, including Medicare details, claiming that the information is necessary in order to issue and send the refund. What they are really doing is collecting information that can be used in identity theft. And then there is the frequent “IRS scam.” A person will call and claim to be an IRS agent. They will demand payment for overdue taxes, and say that if you don’t pay immediately, you will be arrested. They will ask that you pay by wiring money or loading a prepaid card. The IRS never makes a demand or threatens you. Do not give money to a caller claiming to be your utility company. Similar to the IRS scam, this fear-based scam involves someone calling and claiming to be from your utility company. They claim that your utilities will be cut off unless you pay them immediately through money transfer or prepaid card. Again, a utility will not conduct business in this manner. Don’t give computer access to callers claiming to offer “tech support.” Callers will call and claim to be representatives from a tech company, such as Microsoft or McAfee. These scammers will ask for remote access to your computer, for “tech support.” Do not ever give personal information to someone offering computer help. Share these tips with your friends, family and especially, the older adults in your family. Make sure that they realize that giving personal or financial information over the phone is never a good idea, no matter who the person claims to be. Remember – an informed consumer is a smart consumer!